As it played out, my body did endure a hell of a lot in the week following transfusion: nausea that left me unable to eat properly for days, night sweats, unfathomable exhaustion and then a whole host of secondary effects brought on by taking medication to combat the first lot of side effects. I really can’t divulge it all. Bodily functions gone awry are totally off limits – for your sake, and mine! 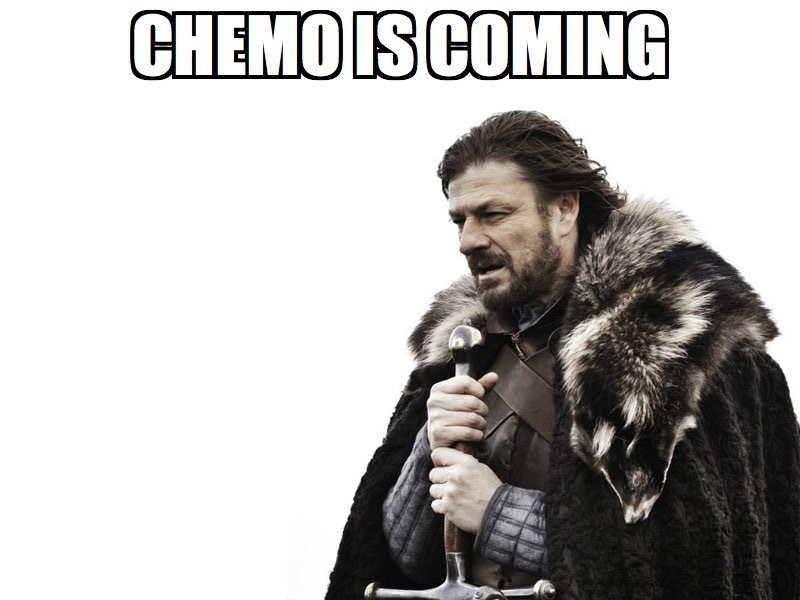 But chemo comes and chemo goes. By the end of the second week, I really started to feel like my old self again. I had energy to (sort of) keep up with my kids, walk every day and eat all the things I love to eat. I even managed to run a whole kilometre a few days prior to going in for Round Two! But…you guessed it…just as I found my feet, the next transfusion, a most sinister beacon, loomed on the horizon once again. While the symptoms the second time were pretty much identical to those I’d experienced before, what amazed me was the way that my body – and brain – pre-empted them. I was like the classic Pavlovian Dog walking into the Epworth last Wednesday: a wave of nausea hit me even before the chemotherapy drugs touched my veins! Talk about mind over matter! Today is Day 7, and so while I’m feeling ok, I’m already thinking ahead to the next cycle in 14 days time. How am I going to teach this brain of mine to calm the heck down? I just finished December 29th so I’ve been there recently. Bodily functions and all. I never trained my brain, I did chemo every other week and I found it impossible to get used to the idea of getting better only to get sick again. It did get easier the night before chemo though. The first couple of treatments I had bad anxiety, but it got better. Crossing the half way mark was the turning point for me because up until then it feels so long and hopeless. All I can say is that I got there, I survived and the after effects are a lot better than I thought they might be based on my chemo experience. You will get there. Friend and relative visits during my better days helped as well as treating myself to some favorite food when I could eat, like pizza. Given your nausea issue I bet you’re going through the losing weight faze like I did, so eat what you want when you can. The friend and relative visits will be a good distraction. I also recommend making a pump up mix to listen to on the drive to chemo, that’s a hard drive. Fill it with fun stuff and guilty pleasure music. Writing helped me a lot too. Putting together a blog post when I was feeling super low helped me feel better as I wrote it down. Hi Jenna, thanks so much for all your pearls of wisdom. It also helps to know not alone in the anxiety stakes. I’ve just finished 2/4 AC cycles. Next up is Taxol, every week for 12 cycles and Herceptin & Pertuzumab every three cycles. It seems like such a lot! It is a lot and it’s crazy that any human being has to go through it. Somehow you will though. Hot baths also helped me a lot when I was feeling super crappy. Get some bubbles baths or salts that smells good. Also, find a good therapist. I saw someone weekly through my first half of chemo and it made a huge huge difference. That was the best thing for it. You need to vent/cry/get everything out and that’s tough to do on your support team as much as you need to, even harder when you have kids I imagine.